Wry, daring and utterly absorbing, The Object of Your Affections is an unforgettable story about two women challenging the norms... and the magic that happens when we choose to forge our own path. Two best friends rewrite the rules of friendship, love and family... and change everything they thought they knew about motherhood. Paris Kahn Fraser has it all—a successful career as an assistant district attorney, a beautiful home in New York City, and a handsome, passionate husband who chose her over having a family of his own. Neal’s dream of fatherhood might have been the only shadow in their otherwise happy life... until Paris’s best friend comes to town. 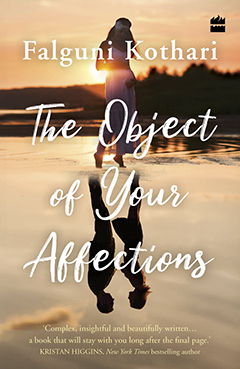 "The Object of Your Affections is a perfect read for fans of messy love stories, Indian style." "In this ambitious adult contemporary, Kothari (My Last Love Story) delivers a rich story of a married couple wrangling with the multiplicity of modern-day reproductive options." "Like she did in My Last Love Story, Kothari uses baby-making as a means to explore themes of friendship and tradition. Paris Kahn Fraser is married to the very hot Neal, a Scottish Indian jewelry-designing baron who loves her unconventional approach to life. Her tumultuous upbringing, involving several sets of adoptive parents, left her convinced that family life was not for her. But she knows Neal wants children, and she wants that for him, too. A solution arrives in her estranged college friend, Naira Dalmia, who flies to New York for a friend’s wedding and doesn’t leave. After a scandal back in Mumbai that left her widowed and unmoored, Naira agrees to be a surrogate. Complications, of course, ensue, and Kothari manages to balance deeply complicated issues of marriage, feminism, and abandonment with enough aspirational escapism to make the book a lot of fun. Paris' dilemma is especially compelling as she comes to terms with her resistance to motherhood: is it a reaction to societal expectations of a "good wife," or past trauma? Kothari offers no easy answers, making this an especially good choice for women's-fiction book groups." "Falguni Kothari has crafted an intriguing tale bursting with culture, friendship, family, love, and complications! Recommend!" "A fascinating, captivating story about love, marriage, wealth and society, and the bonds of lifelong friendship." "Complex, insightful and beautifully written…a book that will stay with you long after the final page." 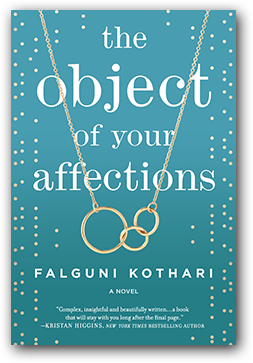 "Author Falguni Kothari’s exquisitely complex story of marriage, friendships, and unconventional choices reminds us that real love requires great courage." "An intensely original and provocative story that tackles the complex challenges a modern woman faces within marriage. What makes a good wife? A good mother? What makes a woman lovable? Kothari grapples with love, ambition, friendship, and motherhood in this brave, insightful novel."